On our most recent trip to research wineries for the upcoming Empordà guide we stopped in at the beautiful Mas Anglada. A project of Luis Conde, this large estate is not only incredibly luxurious, but meticulously preserved. This is not an easy feat given that the older parts of the original farmhouse are 500 years old. But, there is a newer section to the property where their winery and vinyeards are. It’s here, alongside the vines that there is a soccer field of all things (as well as a tennis and paddle courts). 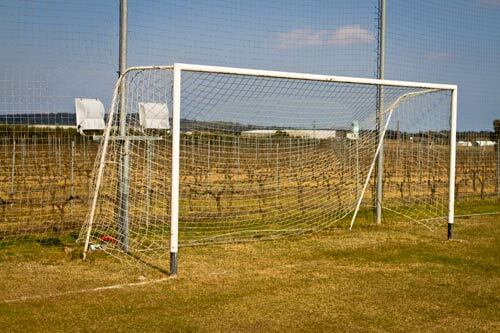 I’ve seen a lot of things in 15 years of winery visits, but never a soccer field plunked down next to one. Apparently, it’s for a yearly Christmas tournament between Luis’s rather large family and the local village of Fonteta that’s just up the road. There’s much, much more to the winery than just a wine-aligned soccer-pitch though and we’re looking forward to sharing everything about it soon in our guide.